Welcome to another installment of the Dollar Box, where I look at special or significant comics with an original cover price of a dollar or less. This month’s issue is Captain Marvel #34, a Jim Starlin effort (with a script assist from Steve Englehart) published by Marvel Comics in the summer of 1974. This isn’t the most memorable or important issue in Starlin’s Captain Marvel run, but it has an energetic visual style, and does conclude with what would prove to be a pivotal moment in Captain Marvel’s life — his death! 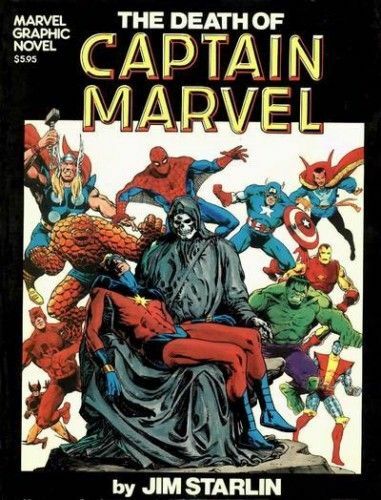 Created only to protect a trademark, Captain Marvel was always a tertiary book at Marvel, suffering through a series of unmemorable stories by rotating creative teams before the series was handed to a young Jim Starlin, first as penciller with issue #25, and with full creative duties by issue #27. Over the brief span of ten issues (which I previously reviewed here) Starlin would redefine Captain Marvel, transforming him into a cosmic warrior for peace and balance, and setting him to battle against the Death God Thanos of Titan, in the first of many such great outer space sagas that would become Starlin’s stock-in-trade. 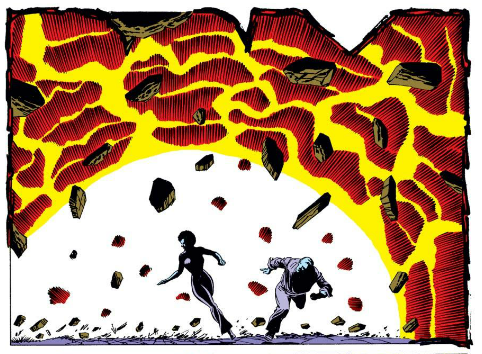 By issue #34, though, that arc is in the rear-view mirror, and Captain Marvel — and creator Jim Starlin — were ready to move on to the next phase in their lives. 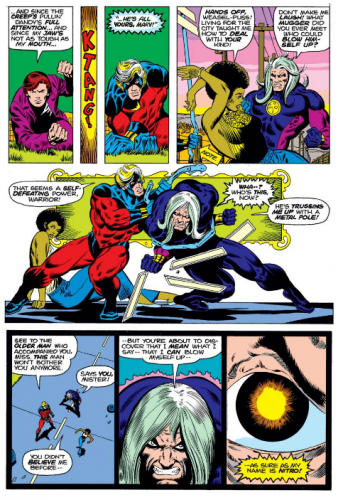 The first several pages of the issue are basic stuff for a 1970s Marvel Comic. 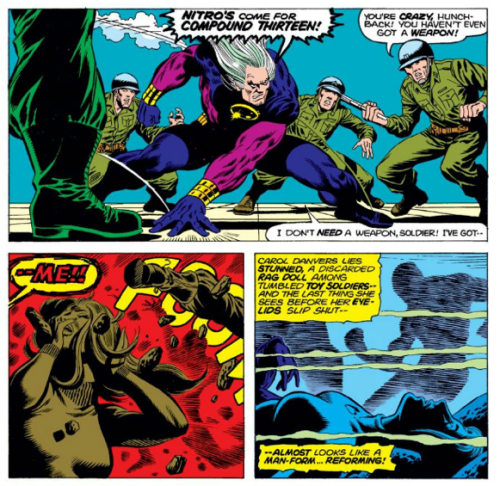 The previous story is briefly recapped, then some long-simmering subplots are serviced, as Rick Jones — Captain Marvel’s earthly companion, with whom our hero must trade places if he is to escape the Negative Zone — catches up on a private life that was sidelined by a certain war for the fate of the solar system. Rick whines a bit about being Marv’s sidekick, breaks up with his girlfriend, then departs on a music tour with his manager and an unenthusiastic new partner … and that’s where things get weird. Weird, at least, by the standards of your usual 1970s Marvel fist opera. 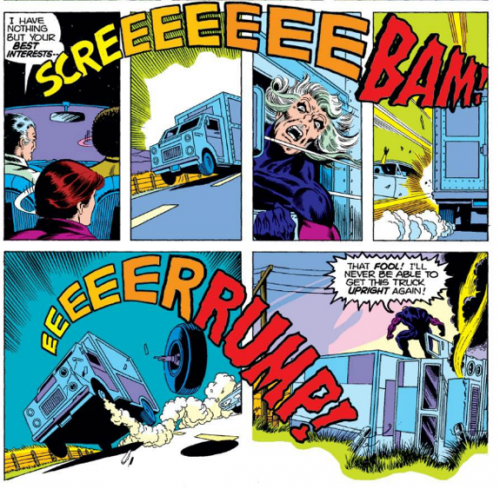 It isn’t the set-up that’s unusual — it’s another off-the-shelf Marvel set piece, without Rick and his companions fatefully crossing paths with a villain intent on stealing a deadly nerve gas. 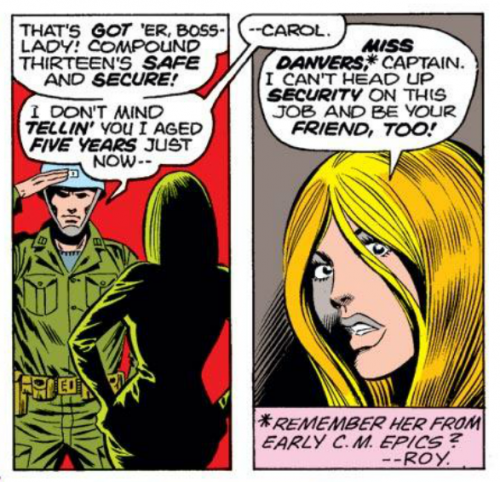 The frame setting is enlivened only by a cameo appearance by Carol Danvers (who later would become one of the more significant female characters in the Marvel line as Ms. Marvel, before assuming the title duties of Captain Marvel, herself). …and then goes after he wants in a dynamic page that serves notice that on a visual level, at least, this won’t be your usual kind of superhero fight. At this point I should note this issue was a personal turning point for me as a comics fan. Probably every comics fan as “that” issue — the one where the form came alive for them, when they first flipped to the credits page to see who it was that had written or drawn a story. For twelve-year-old me, soldiering through a visually indifferent summer of comic books in 1974, this issue left me “Blown Away” (which just happened to be the title of the story). Having come to comics too late to see Jack Kirby at the top of his game (or to see Jim Steranko infuse Kirby’s work with his own particular cinematic aesthetic), the way Starlin drew this otherwise-unremarkable action opened a doorway in my consciousness. It blew my twelve-year-old mind. Forty years later, it’s still pretty sweet. Sure, all we really have here is Captain Marvel — a throw-away character who had just had his Elvis Year thanks to Starlin’s run — slugging it out with a dumb supervillain for a half-dozen pages, but the contest is carried off with exceptional style. There is real visual power behind the blows traded by Marv and Nitro, and the action seems more visceral and personal when Nitro curses like a street-level thug. 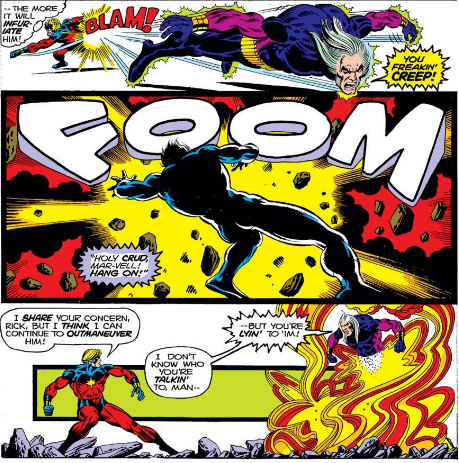 …before meeting his own end with one last FOOM, thanks to a deft bit of trickery by our Kree soldier-hero, Captain Marvel. …and with the freedom of a man quitting his job, Starlin did the unthinkable. He killed Captain Marvel. Cliffhangers where heroes (appeared to) die were no unusual thing in comics, then or now, but this conclusion seemed to have some bite. Having finally defeated Nitro, Captain Marvel struggles to seal off the ruptured canisters of Compound 13 that of villain was trying to steal — a gas that we’d previously been told was the ultimate nerve agent. 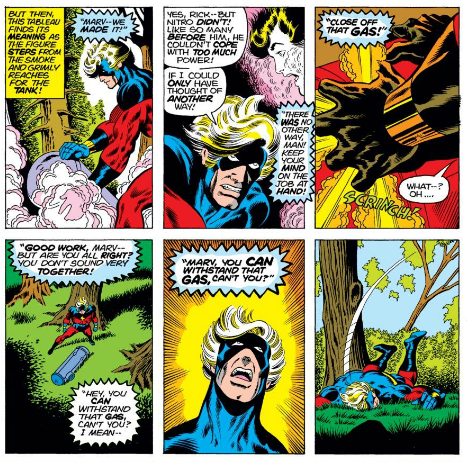 Marv pulls it off, but just barely, and even Rick Jones, watching from the Negative Zone, seems to sense that this isn’t a routine cliffhanger. The next issue box assures us there will be a next issue, but this does seem an unusually “final” final image. In issue #35, of course, a new creative team picks up the pieces, and contrives to restore Captain Marvel to life, and his book would continue on through another thirty-odd unmemorable issues before its cancellation in 1979. But the events of this story would prove unusually far-ranging. In 1982, Jim Starlin was back at Marvel, and the publisher was experimenting with a new, full-length graphic novel form. 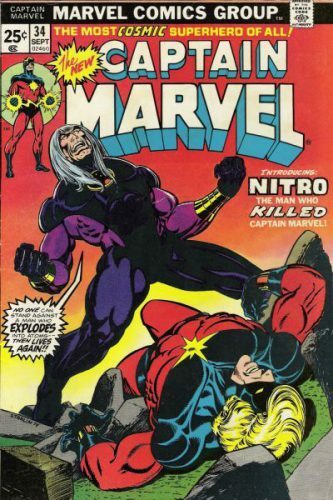 The first installment in the Marvel Graphic Novel line would be The Death of Captain Marvel, where Starlin reveals that Marv has an incurable cancer brought on by …his exposure to Compound 13! So it turns out that Starlin really did, kinda-sorta, kill off Captain Marvel back in issue #34 of his own book — it just took eight years for it to stick. And stick it did. 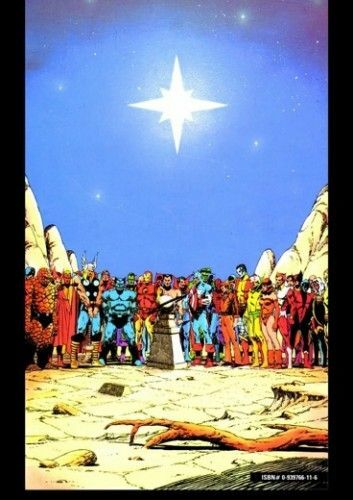 Captain Marvel’s death has proven one of the more significant character deaths in the Marvel universe, touching a number of other costumed heroes, and proving almost singular in offering a genuine end to the story of Captain Marvel. 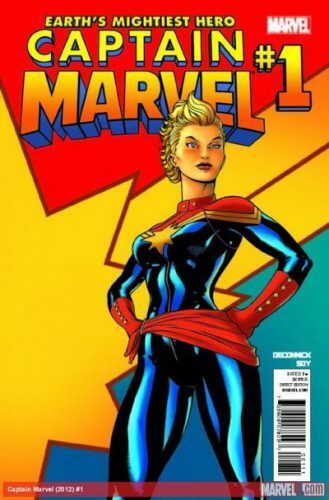 The character would appear again in flashbacks and brief life-after-death cameos, but his big 2008 “Secret Invasion” resurrection was a fake-out, and now the trademark-enforcing mantle of Captain Marvel has been taken up by Carol Danvers (the former Ms. Marvel) in the latest incarnation of this particular title. But all of that was in the distant future, back in the summer of 1974, when this particular comic opened my eyes and made me a comics fan for life. The cover price was .25, but a copy in decent condition will run you about five bucks now. That seems a small price to pay for a well-crafted issue with such a cool secret history, but I’d never tell you to purchase a comic on the basis of its events forming some permanent part of a comic book universe. If Bucky can come back from the dead, then no one is safe in eternal rest …though ol’ Marv has been there, more-or-less without interruption, for going on thirty years! That will do it for another Dollar Box. Join me here in another thirty days for another one-issue wonder with a cover price of a dollar or less. Thanks as always to StashMyComics.com for hosting this column, and if you’d like to read more about the Bronze and Silver Age of comics, head on over to my home blog, Longbox Graveyard, where every Wednesday brings a new column about old comics. Thanks for reading! refers to blister plagues in Romeo and Juliet that they say is a reference to herpes. system can’t keep in check.